During my daily routine the other day of researching companies and analyzing various charts, I noticed a peculiar relationship with one particular equity and the S&P 500. This company is a credit-sensitive entity. In light of that, I wanted to see if it had any ability to “foresee” potential moves in the larger stock market. It turns out it does. The relationship may not work forever as nothing ever does in speculating, but its efficacy since the end of the recession in 2003 is evident. 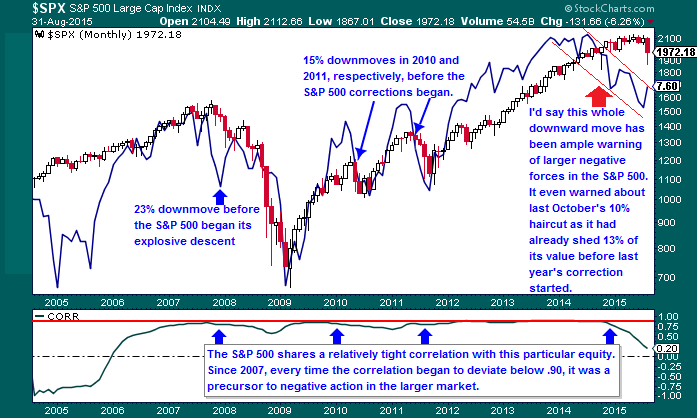 The correlation coefficient is set at 40 periods for a monthly chart. I tried 10, 20, 30, 50, and 60, too, but 40 seemed to have the most telling relationship. Call it massaging the chart analysis if you will, but the relationship is undeniable. Observe the chart below. The S&P 500 is the candlesticks and the “indicator” equity is the solid blue line. It took a little while coming out of 2004 as credit conditions really started to loosen to accommodate the explosive real estate market, but correlation to the S&P 500 finally reached 90%. Since the market peak in 2007, each time we’ve seen a deviation below 90% correlation then it was a clear indicator that something negative was on the horizon for the equity markets. You can see that the price action is telling in and of itself despite the correlation data. Of course breadth readings are just as indicative. If you would’ve listened to the message breadth readings were sending well in advance of the current market action, then you could’ve easily sidestepped making poorly timed and silly purchases. And no, the equity is not Sotheby’s (BID). Sotheby’s has a well-documented relationship as a major-market-top indicator so feel free to parse the web for additional details. For now I’ll continue to gauge the action in this new leading indicator(new to me at least) as the market progresses over the rest of this year and the next. Bear in mind that any one indicator is but one simple tool in what should be a well-stocked toolbox for the purpose of speculating. As for the upturns in the “indicator” equity, they are not as foretelling as the downturns. The upturns seem to almost always occur right along with the S&P 500 so we can’t count on it right now to help guide us in the current bounce. Just my own current quick & dirty read, I’d say the S&P 500 could possibly bounce all the way back up to about 2,040. That’s a very obvious point for all chartists to see. However a retest of the recent lows or even lower-lows is very probable over the next several weeks so employ patience out there.